Properties in Kid Parc average 4.6 out of 5 stars. 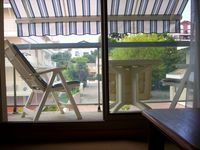 Arcachon center, studio direct access beach, exceptional sea view. Property 6: Arcachon center, studio direct access beach, exceptional sea view. Arcachon-180 ° sea view !! Appt 63m2 2/4 people, terrace. 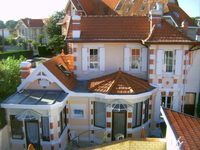 Property 17: Arcachon-180 ° sea view !! Appt 63m2 2/4 people, terrace. Near Arcachon. superb contemporary T3 facing the ostrich port of La Teste. Property 18: Near Arcachon. superb contemporary T3 facing the ostrich port of La Teste. Classified 3 *** 200m from the Bassin d'Arcachon + 2 mountain bikes available! Property 28: Classified 3 *** 200m from the Bassin d'Arcachon + 2 mountain bikes available! Very hospitable owners. Heartfelt thanks to Jean-Claude for attention. Apartment is more roomy in reality. Independent cabin with beds is comfortable. House has splendidly location with 2 exit to seaside and yard. Un accueil tr&egrave;s chaleureux de nos h&ocirc;tes et un appartement superbe &agrave; 5 minutes &agrave; pied du centre-ville. Tout &eacute;tait parfait. &Agrave; recommander sans h&eacute;siter.